Today’s Ventura County Reporter opinion piece by editor Michael Sullivan decries a dirty deed done dirt cheap by the county’s board of supervisors on Tuesday. 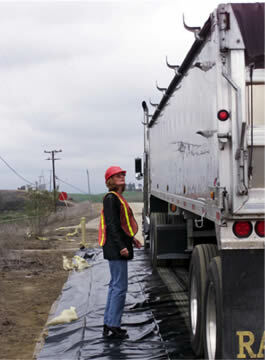 Excavation of highly contaminated soil from Boeing’s Santa Susana Field Laboratory, enough to fill over a hundred trucks, will now simply require an “over the counter permit” for excavation and transport even though the dirt is contaminated with dioxin, chromium, lead, mercury and other contaminants. There has been no word on where the hazardous goo will go, but it will have to be transported through LA County. The supervisors, on a 3-2 vote, defeated a motion by Supervisor Linda Parks that would have made Boeing come up with a “an integrated, transparent process incorporating the public” when it comes to hauling off the first of what will be thousands of truckloads of toxic dirt off the huge lab in eastern Ventura County. In Sullivan’s August 6 op-ed called “Handle with care: Santa Susana Field Lab,” she says a great deal more care needs to be taken hauling away what Supervisor Peter Foy said in the meeting is 2,700 cubic yards of toxic soil. The dirt is leaching pollution down two lab “outfalls” into the Los Angeles River and the Jewish university at Brandeis-Bardin in Simi Valley. That lead agency, the Department of Toxic Substances Control, was nowhere in sight at the meeting. Boeing, on the other hand, was well represented. The company maintained that forcing it to have to comply with an involved permitting process to remove the polluted earth would delay it and the rains would come before the work was done, washing pollutants downhill. The goo had to go right now, Boeing officials told the board, goo that has cost the company plenty. Those plans say what the company must accomplish, but not how exactly. The implications of this decision are enormous and disturbing to many of the Rocketdyne activists who spoke at the board meeting, though some contend that the goo must go and go soon, regardless of process, to protect public health. But unfortunately excavating the muck now requires no more than hiring a contractor to dig the stuff up, dump it into trucks, and off it goes to who knows where, at this point. While there has been no public notification of when and where these trucks will haul their contaminated cargo, the only road usable out of the lab descends Woolsey Canyon into Chatsworth. There will be no regulations requiring prior testing the dirt, making sure it’s sealed securely for transport and no requirements that truck tires be cleaned before they leave the Boeing property, which is in the midst of a cleanup costing over a quarter billion. No officials from the city or county of Los Angeles were at the Ventura County Board of Supervisors meeting when this decision was made. There was also no discussion of how the workers will be protected during this huge excavation nor any indication that they will even be wearing dust masks or told of the hazardous material they will be dealing with. The permit Boeing got, the kind you get for digging a swimming pool says Parks, also means that there are no provisions for insuring that contaminated dust doesn’t blow downwind, which is generally is in the direction of the west San Fernando Valley. I am also yearning for a geology class now after all I’ve learned and have yet to learn! How nice it is to have two web sites where issues can be discussed as they arise……RIS and EnviroReporter. Thank you Michael for detailing the issues up front, and we can count on you for accurate information at all times. Thank you Christina for your comments that always shed extra light on the subject at hand. My own tendency is to always want to comment on the overall situation….the “big picture”. I am always afraid that we will get lost and immobilized in all of the technical details….but then, admittedly, I often seem to lack either the ability or enthusiasm to master those. However, I certainly do recognize that those smaller technical details are very important and need to be discussed carefully. I am sorry to say that I have never taken a Geology class, and that this whole thing is just so not my field. For this reason, I am especially happy for web sites like this that are a great help in catching up with the devil that is surely in those details. I thank you most gratefully. This Cleanup and Abatement Order was specifically for outfalls 8 and 9 which are not the watersheds from the SRE, and that is because that is where the 79 violations that resulted in the $471k fine and subsequent CDO that evolved into the ENTS. The ENTS didn’t work very well because it proposed putting pond treatment train systems atop known contaminated areas, and specifically with regard to NASA, they refused to allow these systems to be built on their property. So the response, was to do a removal action, since NASA was willing to do the ISRA. In addition, the outfall 9 removal is specially the pond sediment of a “burn-runoff pond” the came from the ELV operations in Area 1. This area should come out because of the high concentrations and is a very specific area that is this pond, and the overflow drainage area from it. The ENTS proposal was to put a treatment system on top of this contaminated area, so in a way, it makes sense that NASA might prefer to just take it out, rather than deal with maintenance of equipment that would eventually have to be removed in order to do the SB990 clean-up of that same area. This drainage area leads to a road, and should have BMPs on it throughout the removal of the area above. In Outfall 8, which is “Happy Valley” in Area 1 which drains to Dayton Canyon/West Hills/Chatsworth direction, and is a very steep area. This particular area had an interim measure done several years ago where they removed soil to bedrock. In looking at the area removed before, it missed several significant storage/operational areas (but small areas) and those areas are what is being proposed for removal now. Based on the surprises in the past, and the fact that this area was missed, I think that any areas here that show mounding, or disturbance, and proper screening of all material is paramount. The estimates for the entire site range from 400,000 cubic yards up to 1 million cubic yards, but all these numbers thrown around seem premature since the RCRA reports (9 of 11 are out) still need SB990 background data to determine clean-up levels and that will drive help us know more about how much soil we are talking about. In addition, the feasibility study is just beginning (for corrective measures and require the completion of the characterization and the RAD survey to really have any teeth. For perspective for those who have been watching the progress, the Northern Drainage cleanup that has been going on for almost 2 years is about 11,000 cubic yards to date, and this clean-up that is being proposed in the ISRA is something like 7500 yards. so these truly are interim high concentration areas that are being proposed for removal. You are absolutely right! Where is HazMat? see how easy it would be get this permit then. I was just told a Semi Truck holds 20 yards. This would be a billion truck loads! That’s a lot of DUST! Good stuff! Always on top of it, Radiation Ranger!